Brigadier General Frank H. Wirsig, a Marine Corps aviator, retired from El Toro, Santa Ana, California, as Commander, Marine Corps Air Bases, Western Area, with additional duty as Commanding General, El Toro Marine Corps Air Station. In July of 1930, he won his wings at Pensacola, Florida, he saw field service in Nicaragua, in the Pacific during World War II, and in Korea. An outstanding collegiate track star, General Wirsig in 1927 held the American record for the pole vault. He put in a bid for the Olympic team in 1928 after completing the course at Basic School. From January to November 1929, the General was a Student Naval Aviator at Norfolk, Virginia, and completed his flight training at Pensacola the next summer. He was then attached to Fighter Squadron 9-M at Quantico, Virginia, until leaving for Nicaragua In May 1931. General Wirsig served nearly two years with Marine Aviation attached to the bandit-chasing 2nd Brigade Marines in Nicaragua. He was awarded the Nicaraguan Cross of Valor with Diploma for his service to that country in 1931. On his return to the United States In January 1933, he was again stationed at Quantico with "Marine Fighter Squadron 9" an is mentioned many times in the book by the same name. Transferred to San Diego, California, In June 1937 the General was assigned as a gunnery and flight officer to bombing and observation squadrons, remaining there until ordered back to Quantico in June 1939, to attend the Junior Course of the Marine Corps Schools. After completing the course in May 1940, he served as operations and executive officer of Marine Fighting Squadron 1, 1st Marine Aircraft Group, serving with that unit at Guantanamo Bay, Cuba, from October 1940 to March 1941. In April 1941 General Wirsig joined Marine Corps Headquarters and assumed the duties of Officer in Charge of the Material Section in the Division of Aviation. He was transferred to Cherry Point, North Carolina, in June 1943, where he organized Marine Air Group 61, 3rd Marine Air Wing. The General served as commanding officer of that group until September, then assumed command of Marine Air Group 32. He moved with MAG-32 to the Marine Corps Air Station at El Toro, in January 1944, and went overseas with it the next month. Named Acting Chief of Staff of the 3rd Marine Air Wing in August, he was based in Hawaii until hospitalized and subsequently returned to the United States In December. He assumed duties as Chief of the Aviation Section of Marine Corps Schools at Quantico in January 1945. In the late summer of that year, General Wirsig was reassigned to Hawaii, where he assumed command of Marine Aircraft Group 15. While serving in that command, he received a Letter of Commendation for his unit’s movement of equipment and personnel from the Philipplnes to China. Ordered back to the Marine Corps Air Station at El Toro, In August 1947, he served there as Operations and Training Officer until the following summer, when he became Chief of Staff of Marine Air Reserve Training Command at Glenview, Illinois. outstanding service in this capacity. General Wirsig was then named Commanding Officer of Marine Wing Service Group 17 In Japan in January 1954. Subsequently assigned as Chief of Staff of the 1st Marine Aircraft Wing, he remained at that post until August of 1954. Ordered to Headquarters Marine Corps, Washington, DC., he served until June 1956 as Director of Information. On July 13, 1956 he assumed his current duties at El Toro. The General was promoted to rank of Brigadier General on August 27, 1954. A complete list of the general’s medals and decorations includes the Legion of Merit with Combat "V”; the Navy Unit Commendation; the Second Nicaraguan Campaign Medal; the American Defense Service Medal with Base clasp; the American Campaign Medal; the Asiatic-Pacific Campaign Medal; the World War II Victory Medal; the National Defense Service Medal; the Korean Service Medal with one bronze star; the United Nations Service Medal; the Korean Presidential Unit Citation; and the Nicaraguan Cross of Valor with Diploma. 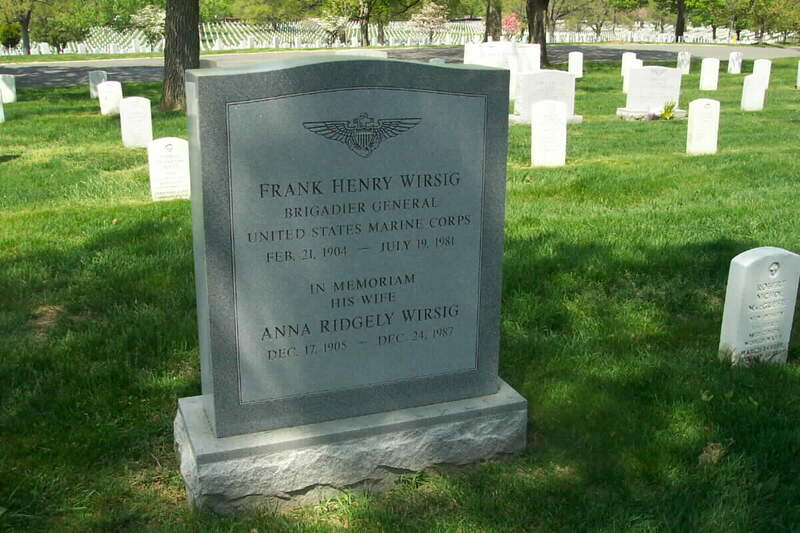 General Wirsig died on 19 July 1981 and was laid to rest with full military honors in Arlington National Cemetery. His wife, Anna Ridgley Wirsig (17 December 1905-24 December 1987) is buried with him.